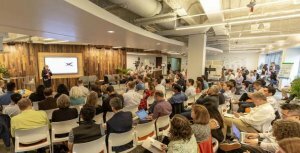 While the Seattle-area remains a hotbed for healthcare innovation, there’s a huge delta between entrepreneurs, physicians and the rest of the health care industry. But an innovative health tech Petri dish of sorts is making huge strides in changing that. And the leaders of Cambia Grove hope physicians from our community can help make that happen. “We have an incredible wealth in our community of people bringing innovative solutions to health care, and we have the best health care institutions and providers in the world. 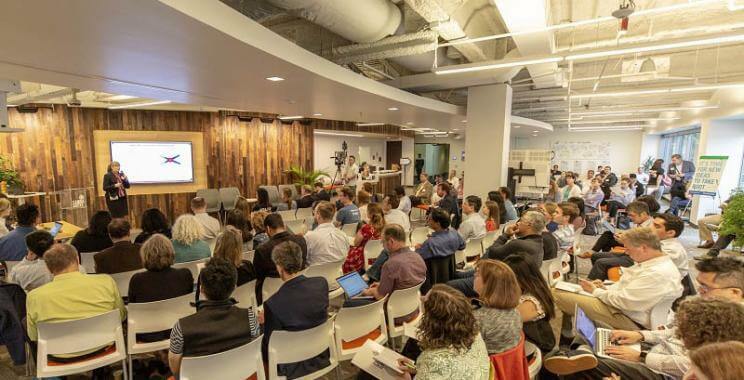 But they don’t tend to overlap in working, talking, connecting to make sure we’re solving for the right problems in health care,” says Maura Little, Executive Director of Cambia Grove. Downtown Seattle-based Cambia Grove is a unique health care innovation hub focused on bridging the gap between entrepreneurs and the traditional health care sectors. It offers a variety of programs and services including brown bags, workshops, doctor’s hours where physicians can meet with entrepreneurs and its unique “Five Points of Health Care” programming that features a monthly series digging deep into all aspects of health care and their unique perspectives: patient, payers, providers, policy makers, and purchasers. There are a number of ways physicians can get involved. You can join Cambia Grove’s Sounding Board, a curated group of experts in their field. Members of the Sounding Board support health care innovation by offering their experience and expertise to those navigating the system, providing insight to barriers to innovation in the system and opportunities to improve the system. That can include serving as a panelist at a 5 Points Conference, hosting a lunch and learn session, holding office hours to consult with entrepreneurs, participating in roundtables, judging competitions and more. “We recognize doctors are extremely busy. But we believe the health care system needs to transform, and it can’t be done without them,” Little says. So she’s encouraging members of the King County Medical Society community to get involved. If you’d like to learn more about Cambia Grove and how you can get involved, you can email info@cambiagrove.com or contact me, jkerns@kcmsociety.org. And who knows, you just might have the next big multi-million dollar idea that could help transform health care.